Do I Need A Master’s Degree to Figure Out Extreme Couponing? There are three types of learners: Visual, Auditory and Kinesthetic (or Tactile) learners. I’ve been told I’m a visual learner, but I would argue that there is a fourth type of learner: the Spell-It-Out-For-Me-Exactly learner. Sometimes, I just don’t get it unless it’s explained to me very clearly and in very basic language. Honestly, it took someone about 10 separate explanations before I finally grasped what call options were. If you are the type of learner for whom it takes a while for things to click, I’d like to know if you’re having as much trouble as I am with all of this extreme couponing business. On the one hand, extreme couponing is a very simple idea. Get the most discounts possible on all of your necessities like toiletries and packaged food using a variety of manufacturer’s coupons, store coupons and in-store specials. On the other hand, it requires all kinds of effort in terms of research, coupon storage and at some point product storage because you’re going to be buying 45 cans of Del Monte Green Beans at a time, every week! It also turns the very mundane task of grocery shopping into something of a freelance full-time job. What is with the Giant Binder? I’m trying to save money. I know I need to increase my income, but in the meantime I’m giving this frugality thing a real run for its money. But when I started reading some of the “how to coupon” guides, the first tip everyone gave was to get yourself a binder. Really? 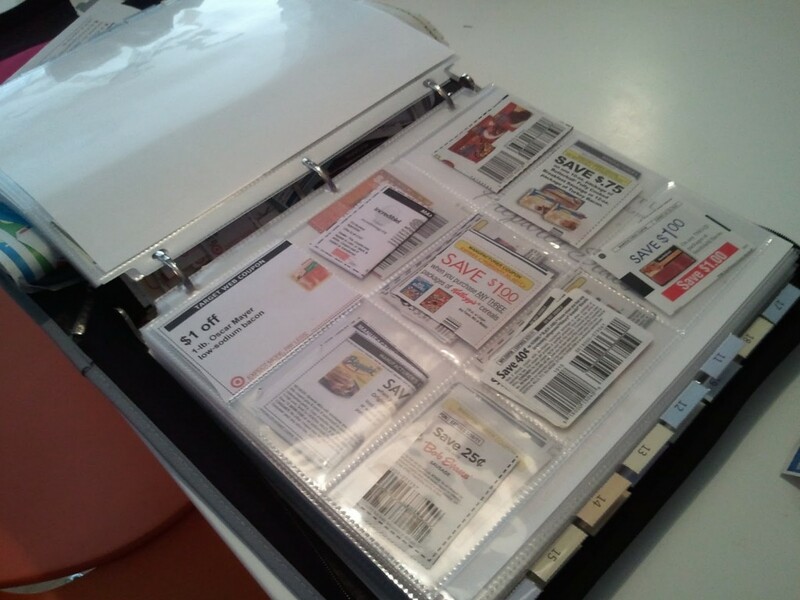 A giant binder with page protectors to keep coupons in? Can you imagine shopping with a giant binder under your arm? I already have a hard time keeping my purse on my shoulder without it swinging off every time I lean over to grab a head of lettuce (OK, I was reaching for a bag of sour gummy worms). Another drawback is that if you are going all out with the coupons, you need to go shopping at midnight or other off hours to not hold everyone else up who’s in line behind you. I like to go grocery shopping on my way home from somewhere else. I don’t want to make shopping into a whole separate event. Then there’s the jargon. And finally, you have to find all of these coupons! There is no magic assistant who is clipping and printing all of these coupons, you’ll have to scroll through feeds and blogs, browse the Sunday coupons and choose all of the coupons yourself. That is a LOT of time. Extreme couponing can make sense for some people and help save families a lot of money (I respect people who are going from $600/month to $200/month in grocery expenses), but we’re just two people and spend about $250/month on groceries. I’ll be happy with saving $50/month. And I really don’t need 25 tubes of toothpaste. Browse those grocery store weeklies before recycling them. They come once per week, and usually Wednesdays are the day when both last week’s ad and this week’s ad are effective. Double the sales! Now don’t go crazy. You’ll see what produce, meat, and toiletries are on sale. This will help you decide if this is a good week to stock up on paper towels or whatnot. Going to the store for just one thing? Check for a coupon first. Say you need shampoo. Just Google your brand for a coupon. A lot of the drugstore brands have a $1 off coupon permanently floating in cyberspace (Example: L’Oreal always has one on their website, or you can search a site like Coupon Sherpa to check out all the L’Oreal coupons currently available). For a while I was obsessed with Newman’s Own Creamy Caesar dressing. 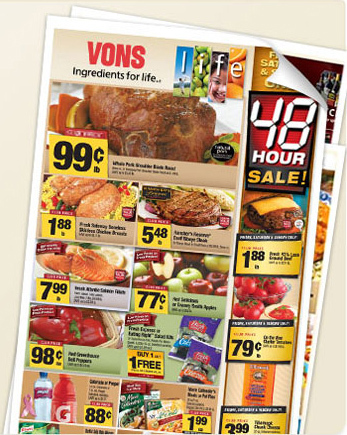 The Newman’s Own website usually has coupons available. It’s easy to remember to get a coupon for the handful of items you’re buying. It’s harder to use a Dewey Decimal system to catalog coupons in order to run arbitrage on an Oreo cookie sale. Come on guys, don’t we have better things to do? Don’t buy everything you want. Over one third of the food produced in the world each year is never consumed (it’s lost or thrown out before it can be eaten). That’s a huge waste and I don’t want to contribute to it any more than I already do. It’s hard on a personal level to resist buying small food items too. I’ve been frugal with clothes, shoes, travel and eating out. So I’ve bought all kinds of snacks and novelty items while grocery shopping. I like to try new foods but it’s becoming a replacement form of entertainment. Well, I’m seeing those things add up to probably $50-$60 a month. That still doesn’t seem like a lot to me, but my body could use a break from eating junk everyday. (Side note: I haven’t bought any candy, chocolate or Cheetos in February! Success!) Cut out half of your novelty foods to see a big difference in savings as well. So there you have it. Moderate Couponing in a Nutshell. Do a little research each week, print web coupons when you know exactly what you need and cut out at least some of the fun foods. And if you do get the Sunday paper, check those coupons as well for foods you will actually eat and toiletries you actually need. Why are you buying men’s deodorant for an all-female household? Don’t give me that crap about it smelling better! Extreme couponing is turning some people into hoarders and eventually that becomes expensive. So practice moderation. And don’t waste your precious time. Do you have the ultimate guide on extreme couponing that is easy to understand and won’t make my head spin? Are you an extreme couponer? Will you join the moderate couponing non-craze? I want to know what you’re doing with coupons besides making very tiny papier-mache figures out of them.